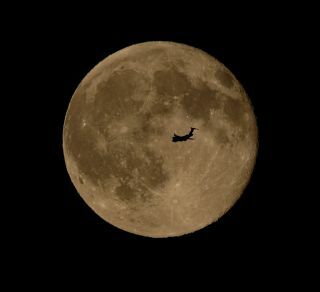 An airplane flies in front of the “blue moon” full moon of July 31, 2015 in this photo captured by skywatcher Chris Jankowski of Erie, Pennsylvania. You'll probably hear a lot about a "supermoon" over the next few months. This is not a term that astronomers use, but here are some facts about what will actually happen. A full moon is when the sun, Earth and moon line up, with the Earth in the middle. As seen from the surface of the Earth, the moon is fully illuminated. Because it is opposite the sun in the sky, the moon rises in the east just as the sun sets in the west. And, roughly 12 hours later, the moon sets in the west just as the sun is rising in the east. Supermoon sale, site wide discount 15% off, this weekend only. Use Code: MOON15. A minute before that, the moon's phase is "waxing gibbous," and a minute later it is "waning gibbous." Each full moon occurs roughly 29.53 days after the previous full moon. It's "roughly" because the moon's orbit around the Earth is not a perfect circle, but is instead elliptical in shape. So the exact time of full moon varies a little bit from month to month. The most important result of the moon's elliptical orbit is that sometimes the moon is closer to the Earth, and sometimes farther away. The time when the satellite is nearest is called "perigee" and the time when it is farthest is called "apogee." Notice how less than a day's change in position makes it clear that the moon is no longer full: You can see that it is lit more from the left side. Events like the full moon and perigee occur at exactly the same time when viewed from anywhere on Earth, even though the local time on the clock may be different. This month, both the full moon and perigee occur when it is daytime in North America, and the moon is below the horizon. The best time to see the full moon close to perigee will be on Saturday evening, Aug. 29. The moon will be a few hours past full, and perigee will be a few hours in the future, but that's the closest to simultaneous the events will get this month. The important thing for astronomers is that the perigee distance is less than 223,690 miles (360,000 km). When the moon gets this close, its most important effect on the Earth — the ocean tides — gets stronger. On the day of perigee and the three days following, Earth will have larger tides than usual. The full moon of September is traditionally called the Harvest Moon, because it rises around sunset on several successive nights, giving farmers extra light in the evening to bring in their harvests. The September full moon will also pass through the Earth's shadow, causing a total eclipse of the moon, visible on the evening of Sept. 27 in North and South America, and the morning of Sept. 28 in Europe and Africa. When the moon is close to full, observers can see the strong contrast between its grey plains and white mountainous regions, which some people see as the "man in the moon" and others see as a rabbit. Full moon occurs this month at 2:35 p.m. EDT on Saturday, Aug. 29, 2015. With the naked eye or a small pair of binoculars, you can easily see the three main dark plains on the upper half of the moon, which bear the fanciful names of the Oceanus Procellarum (Ocean of Storms), Mare Serenitatis (Sea of Serenity) and Mare Imbrium (Sea of Rains). These were named before scientists knew that there were no open bodies of water on the moon, and no atmosphere to cause storms or rains. Look also for the brightest crater on the moon, Tycho, with its beautiful system of rays, caused by material expelled by the impact of an asteroid millions of years ago. Editor's note: If you capture an amazing view of the August full moon, or any other night sky view, that you would like to share with Space.com for a possible story or gallery, send images and comments in to managing editor Tariq Malik at: spacephotos@space.com. This article was provided to Space.com bySimulation Curriculum, the leader in space-science curriculum solutions and the makers of Starry Night and SkySafari. Follow Starry Night on Twitter @StarryNightEdu. Follow us @Spacedotcom, Facebook and Google+. Originally published on Space.com.